Rates apply for pets traveling in the cargo area and may vary according to pet weight and airline. Call your airline before booking your ticket online for specific pet rates and requirements. All kennels must be equipped with food and water container(s), proper ventilation, lockable door latch(s), and labels that read “LIVE ANIMAL – This Side Up” placed on the top and sides of the kennel. 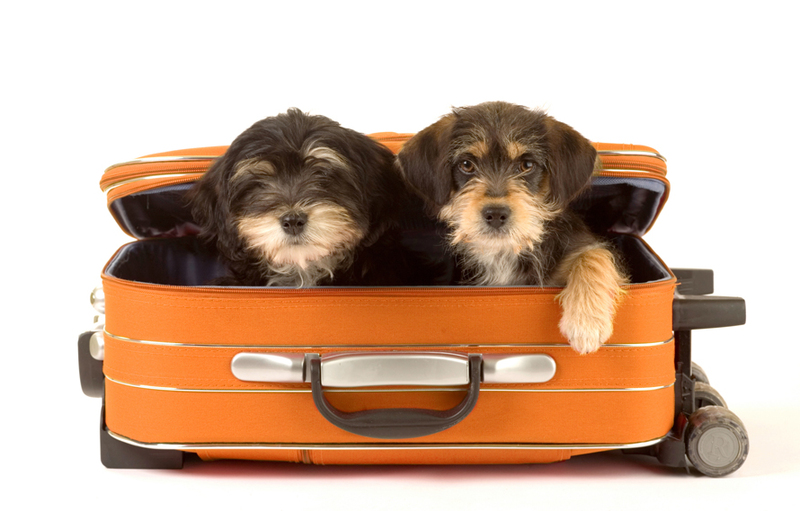 Dogs and cats must be at least 8-weeks old and weaned before they can travel by plane. Airlines require a health certificate, within 10 days of travel, ensuring your pet’s good health and vaccination record (necessary for both cargo and cabin areas). Airlines have a one-pet-per-passenger policy. If an airline allows your pet into the cabin area as carry-on baggage, you must follow all carry-on baggage regulations. Pets permitted into the cabin area as carry-on baggage are not protected under the Animal Welfare Act. The pet container must fit under the cabin seat in front of you and must have a waterproof bottom. Airlines recommend that pets wear an ID tag that includes the pet’s name and owner’s contact information in case of an emergency. The U.S. Department of Agriculture regulates how many animals the airlines can allow in the passenger cabin on a given flight (an advance reservation for your pet is therefore essential). The FAA requires that animals remain in their kennels at all times while on board the plane. Restrict your pet’s food and water 4 hours before departure to minimize his/her urge to potty. Freeze the water so it thaws by the time your pet is thirsty but won’t splash out during loading or unloading. Take along a few of your pet’s favorite chew toys and something with your scent on it to help settle him/her. Consider a mid-week or late-night flight, it usually has fewer passengers. Most airlines and travel agencies can provide additional information about pet care requirements for international flights.